A delicate creamy Calendula and Jojoba oil baby soap inspired by two beautiful little girls. 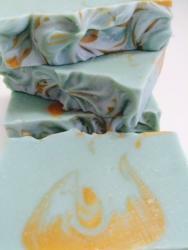 What happens when you mix Blue Gum and Lemongrass essential oils? You get Bluegrass, Bluegrass soap that is. Curly Squid's Fisherman's Soap - Foams in salt water and is scented with Aniseed oil, which is irresistible to fish. Flower of Flowers Soap. Scented with Ylang Ylang and Citrus essential oils and studded with multi coloured soap shreds. Focus Soap, green, purple and white soap scented with Rosemary essential oil, great for study. Gold Medal Chocolate Soap, scented with rich cinnamon and tangarine essentials oils and topped with gold mica for a winning finish. The sweetly fresh scent of Lemongrass essential oil swirls beautifully through green clay, to make a refreshing and uplifting soap. Naked Nanny Goats Milk Soaptm No scent and no colour, that's why its naked. Pinxie Minxie Fu Fu, a fabulously feminine soap in pink, white and silver. Siberian Snow Soap. Made with true Siberian Fir Tree oil from Russia and frosted on top with a layer of silver mica snow. Keep your soap high and dry with a wooden slat soap dish. It will help keep things tidy and make your soap last longer. Stress Relief Soap. Some days we all need a little relief. Sundance. An elegant red and white clay swirled soap with four different citrus scented essential oils and dash of earthy patchouli. Sweet Hearts Lavender Soap. Combines soft pink clay with Lavender essential oil and topped with two delicate hearts.